Willkommen in unserem Ferienhaus 'Home-from-Home' am Stadtrand von Hayle. 67 Der Trevithick Court befindet sich auf dem Ferienpark Tolroy Manor in einem ruhigeren Teil des halbbewaldeten Geländes dieses alten Cornish Manor und bietet Platz für maximal 4 Personen. Das Anwesen ist komplett doppelt verglast und verfügt über ein positives Belüftungssystem. Die komfortable Unterkunft besteht aus einem offenen Wohn- / Ess- / Küchenbereich, einem hellen, hellen Badezimmer. mit Badewanne und Dusche über. Die Doppel- und Zweibettzimmer verfügen über neue Betten (ersetzt Juli 2018), viel Stauraum für Kleidung, Nachttisch und Nachttischlampe. In beiden Schlafzimmern gibt es einen Mini-Ölheizkörper und im Wohnzimmer einen Flammenofen. Der Esstisch und die Stühle wurden dieses Jahr ebenfalls ersetzt. Das Anwesen wird vor jeder neuen Vermietung professionell gereinigt. Die Bettwäsche wird frisch gewaschen und die Betten sind bei Ihrer Ankunft bezogen. Bitte beachten Sie: Handtücher werden NICHT bereitgestellt. Es gibt keine zusätzliche Gebühr für Elektro. Das Badezimmer verfügt über Badewanne mit Dusche, klappbare Duschwand, Duschwanne, Waschbecken, WC, Rasierer, Handtuchhalter, Abzugshaube und Spiegel. Draußen: Vor der Unterkunft befindet sich eine kleine Terrasse mit einer Bank. Es gibt auch 2 Klappstühle im Schrank in der Lounge. Das Parken für ein Fahrzeug ist bequem in der Nähe auf der Rückseite der Unterkunft. Zusätzliche Parkplätze stehen auf dem Hauptparkplatz zur Verfügung. Reinigung / Handtücher / Bettwäsche / Haushaltshilfe: Frisch gewaschene Bettwäsche wird bereitgestellt und die Betten sind für Ihre Ankunft bereit. Die Unterkunft wird für jede neue Ankunft gereinigt. Handtücher werden nicht geliefert. Etwas Besonderes feiern? Wir können arrangieren, Blumen, Wein usw. Bitte fragen Sie nach Einzelheiten. Andere: Bügelbrett und -airer im Schrank im Aufenthaltsraum. Staubsauger und Bügeleisen im Kleiderschrank mit zwei Einzelbetten. cosy home, easy and fantastic to reach contact, great Location at the camp Ground with great ammenities such as pool which our Kids loved! We are so pleased you enjoyed your stay and the kids enjoyed the pool. It is a real plus for people - especially with children, to be able to make use of the facilities the Park has to offer if they choose, at no extra cost. Thank you for taking the time to post a review. We're really glad the property, the location and the facilities all helped to make it a great stay for you! Das Cottage ist gut ausgestattet aber sehr eng. Wir vermissten eine Kaffeemaschine oder Filter. Etwas störend war die direkte Umgebung im Ferienpark, man hatte keine Privatsphäre. Der Kontakt zur Vermieterin war sehr freundlich. Die Lage zum erkunden der wunderschönen Landschaft war super. Thank you for taking the time to write a review for us. We're delighted that you enjoyed exploring the many beautiful beaches and the stunning landscape that surrounds the area and is within easy reach of Hayle. While we do try to make sure there is everything you need for an enjoyable stay, unfortunately there just isn't space on the kitchen worktops for a coffee machine. We hope it did not detract from your stay too much. 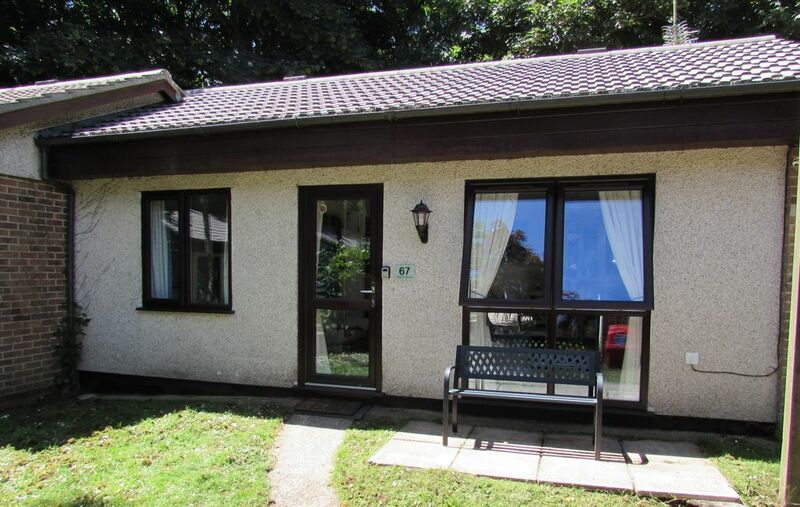 A week away in bungalow number 67, brilliant value for money. The owner Anne Marie was so organized before our stay .Thank you. The bungalow was clean and tidy and had all the basic bits and pieces that made our stay comfortable. The park itself was in good location for St Ives and surrounding areas. Would definitely recommend it, hope to go back again soon. The property has everything you need for a great stay. The owner Anne Marie is very friendly and so efficient and organised before your stay. Thank you. Things that let the property down are not down to the owner but the park, bad points there is a bright street light right outside bungalow. ( Maybe blackouts might help) which made it hard to sleep, the staff on the site did not have good attitudes and were quite lazy, the pool was broke sent to other park which was closed. All in all good for the money it's a very clean chalet and well looked after. Thank you so much for your great review, we are delighted that you enjoyed your stay at No. 67. We take on board your comment about the light outside although we have never found it a problem as it is mainly the lounge that the light affects. With the bedroom door shut, we don't notice it at all. There are normally thicker curtains at the lounge window but I brought them home to wash last time we were there and left the lighter-weight ones instead. We were sorry to hear that you had some issues with the Park and the Park staff. We have always found them to be friendly and helpful although we understand that, being the beginning of the season, there may be some new staff learning the ropes. I have spoken to the Manager at Tolroy Manor with regard to the problem with the pool. It seems there was a problem with the boiler which meant that the temperature of the water couldn't be managed properly so, in the interests of public safety, the pool had to be closed until the appropriate part was replaced, which I understand was just for the day. I do apologise that the alternative pool you were directed to at another Park was closed too as they should have been aware of that. We hope that the issues did not spoil your holiday. Clean and tidy little cosy in the bedrooms, very cold in the time that we were staying . Thank for taking the time to leave a review for No. 67, we're glad you enjoyed your stay. I did think about you over the weekend, I think that was probably one of the worst weekends weatherwise you could have had for your first visit to Cornwall! It was wet, windy and cold - not things you would normally associate with Cornwall. We always find when we're there over the winter that the heaters in the bedrooms and the lounge keep it warm and toasty when its cold outside. I'd definitely encourage you to come back in the summer, and enjoy Cornwall at its best too. Good Vodafone cover, no WiFi. Lots of thoughtful touches which make a huge difference - olive oil, condiments, tea, coffee, sugar which saves on the packing. Good range of kitchen utensils, chopping boards, microwave etc. Clean property, nice décor, very hot water, quiet handy location. Plenty of information about dog friendly places and activities locally. Owner was very helpful and friendly, patiently repeating 'how to find us' directions. I would book this property again. Thank you so much for your great review, we are delighted you enjoyed your stay. From many years of self-catering holidays we always found it frustrating that you had to bring even the most basic condiments with you, so, as we have them there anyway, we decided to leave them for others to use too. The last thing you want when you arrive is to have to unpack the car to find the tea and coffee, and, although Asda is only down the road, you don't always want to be rushing out in the middle of making your meal for some salt! Hope you found all the information useful - out of season is certainly the best time to come with our doggy friends as they can make use of more of the beaches before the summer restrictions come into force. There is no wifi in any properties on the site currently although we understand that it is being looked into. The mobile internet signal is good (depending on network), and, from 1st March to 31st October, free wifi is available in the Bar and Reception area of the main building. I have now uploaded the plan of the site that I send with the confirmation to my phone so that I can easily ping it over to a mobile if anyone is in a similar situation, but we got there in the end. We look forward to welcoming you back to No.67. Hayle und 3 Meilen Sandstrand ist 1,5 km von der Website. Hunde sind an diesem Strand vom 1. April bis zum 31. Oktober nicht erlaubt, jedoch gibt es einen schönen hundefreundlichen Sandstrand in Porth Kidney, Lelant Downs, etwa 4 Meilen entfernt, und auch in Perranporth. Der nächste Bahnhof befindet sich in Hayle, etwa 1,5 km von der Anlage entfernt. Der nächstgelegene Flughafen ist Newquay, der etwa 24 km entfernt ist. Alle Kilometer sind ungefähre Angaben: Hayle - 1 Meile, St. Ives - 5 Meilen, Penzance - 10 Meilen, Lands End - 20 Meilen, Truro - 22 Meilen, Falmouth - 24 Meilen, Newquay - 29 Meilen, Eden Project (St. Austell) - 37 Meilen, Padstow - 37 Meilen. Hayle hat eine Reihe von Restaurants, Pubs und Imbissbuden, die gutes Essen servieren sowie eine gute Auswahl an Supermärkten für jeden Geldbeutel. Es gibt eine große Asda innerhalb einer Meile von der Seite mit einem kleinen Spar-Laden gegenüber. In der Nähe der A30-Kreuzung befindet sich Lidl, während sich auf der gegenüberliegenden Seite der A30 im Einkaufspark M & S, Next und Boots befinden. Lloyds Bank ist nur eine Meile von der Website mit einem praktischen Pull-in Layby in der Nähe und einem externen Geldautomaten. Es gibt auch einen Geldautomaten außerhalb von Asda. Es gibt auch eine Apotheke (Boots), Spielzeugladen, Tierhandlung und verschiedene individuelle Geschäfte, eine Bibliothek mit Internetzugang; Ärzte; Zahnärzte und verschiedene Friseure und Schönheitssalons. Der 1,5 km lange Sandstrand von Hayle und die Küstenwanderwege liegen etwa 1,5 km von der Anlage entfernt. Für Vogelliebhaber ist die nahe gelegene Flussmündung eine beliebte RSPB-Site. Einige Broschüren werden im Welcome Pack in der Unterkunft bereitgestellt und geben Informationen über Cornwalls Attraktionen. Die Park Reception bietet jedoch eine Fülle an aktuellen Broschüren, Papieren und Broschüren. Bookings and enquiries are welcome by either phone or e-mail. Up to 3 medium sized dogs are welcome at No.67. The charge per dog is £25 per week. There is no additional charge for electric. Changeover Day: Change over day varies for Short Breaks,, however bookings for 7 nights are generally Saturday - Saturday unless otherwise agreed. The bungalow is available from 4pm on the day of arrival. Please vacate by 10am on the day of departure. Notes on prices: Up to 2 medium-sized or 3 small well-behaved dogs are welcome. There is an additional charge of £25 per dog per week. As with our own dogs, please do not allow your dogs on the beds and if you like them to sit with you on the sofa, please bring a cover for it with you. The Park rules state that dogs must be kept on a lead at all times throughout the Park. Please do not leave dogs in the property on their own, if you do so, any damage must be paid for. The Park has the right to ask for any dog causing a nuisance to be removed from the site. Please clean up after your dog.